Life has turned upside down for academically-gifted student Stewart Inkster. In the space of two years, his beloved mother has passed away from cancer, his father has found new love with his colleague Caroline and they have moved across the city of Vancouver to live with her and her teenage daughter Ashley. In addition to this move, Stewart has left his former school, Little Genius Academy, and decided to attend the same high school as Ashley. This move pushes him out into the real world, where he hopes that he will be able to improve his social skills (which are seriously lacking in comparison to his academic skills), and make him a gifted all-rounder. But while Stewart is 89.9 per cent happy with the move, the same cannot be said for Ashley. Better known in the school community for her looks rather than her smarts, Ashley knows that the social chain is precarious, and worries that her unwelcome association with Stewart will make her popularity plummet. Worse still, no one knows the real reason that her parents split up (her father came out as gay) and she worries that this will also be a blow to her social status. With these fears hanging over her head, as well as an awkward home situation, it’s no wonder that Ashley can’t get used to all of the changes that have just occurred. This book turns the concept of conventional families on its head. As such, the author proves that there is no such thing as a ‘normal’ family. The ideal requisite family of days gone past (made up of father, mother, son and daughter) has been out-dated and replaced by blended families that are made up of divorcees, widowers, any children that they may have had from previous marriages, and the optional pet. Taking a slightly unorthodox approach to creating the idealistic four-person family as mentioned above, the author has introduced new concepts into the mix, and created variations on the family theme. Ashley can’t get used to the idea that her father is gay and has a new partner, but her views aren’t homophobic- rather, they stem from feelings of distrust after it took him so long to admit the truth to her. Stewart misses his mother every day and breathes in her molecules from objects she used to own, hoping that those molecules will then mesh with his, and help keep her presence alive. Although he likes and respects Caroline, nothing she could ever say or do would replace the memories he has of his own mother. And even though Ashley and Stewart learn to tolerate each other, there is still that sense that they have been thrown together as a family unit, which may never be fully complete, even if their parents eventually marry. They have too much history apart from one another for that to ever happen. This is an interesting and entertaining novel that readers are sure to learn a lot from. Stewart’s borderline autistic thoughts and behaviour, in comparison to Ashley’s denseness and social views make this a somewhat amusing read, juxtaposed with their efforts to live within a forced family unit. 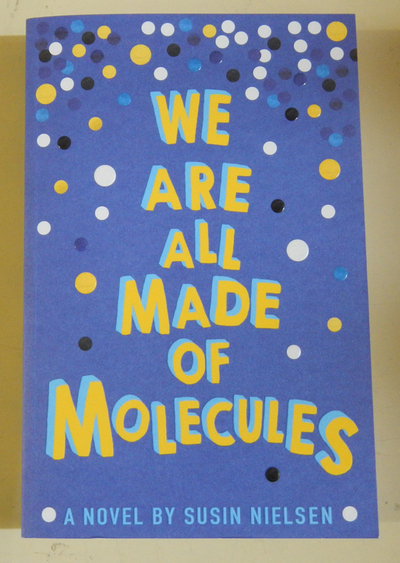 We Are All Made Of Molecules is well-worth reading for a different take on blended families and the many situations that arise from their creation.